This is a great read below is my coles notes version for thous of you know who coles notes is. Please if you read nothing else this month if your in business or sell a products or a designer you must read. Customer-centric organizational mindset – is a must as a UX designer we are shifting to the reality of the world we are not uxdesigner we are not product designer I was starting to think we were Service Experience designer but no we are entering “The age of Customer-Centric Designer” Victor Henry Ramirez. If we want to help change the world we need to work with customer-centric organizational mindset. Digital disrupters like Salesforce and Amazon took the whole customer-first concept a huge step further by actually establishing direct ongoing relationships with their customers. They didn’t have customer segments anymore—they had individual subscribers. And every one of those individual subscribers had their own home page, their own activity history, their own red flags, their own algorithmically derived suggestions, their own unique experiences. And thanks to subscriber IDs, all the boring transactional point-of-sale processes disappeared. Ten years ago there was no Spotify, and Netflix was a DVD company. Today both those companies own a significant percentage of the total revenue of their respective industries! Today successful companies start with the customer. That’s digital transformation: from linear transactional channels to a circular, dynamic relationship with your subscriber. Companies that know what their customers want, and how they want it, will succeed over companies that spend a lot of time and effort creating a product they think is a good idea, then spend equal amounts of time and effort trying to persuade people to buy it. 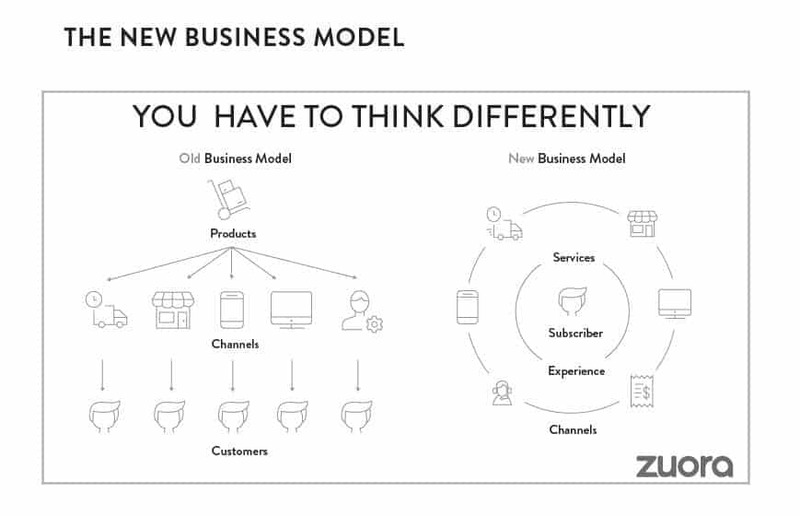 This shift, from a product-centric to a customer-centric organizational mindset, is a defining characteristic of the Subscription Economy. Today the whole world runs “as a service”: transportation, education, media, health care, connected devices, retail, industry. Subscriptions themselves, of course, aren’t new. The most basic definition of a subscription is simply a piece of writing beneath a document (subscript): a name, a note, an addendum. When two parties are involved, that constitutes a mutual agreement, an accord, a relationship. As a business model, subscriptions have been keeping journalists, authors, illustrators, historians, and cartographers paid for hundreds of years. Subscriptions also sold a lot of bad CDs in the eighties. The product economy is over. Here’s how to survive in the subscription economy.